She was a media celebrity, founder of her own church, author and pioneer radio evangelist. 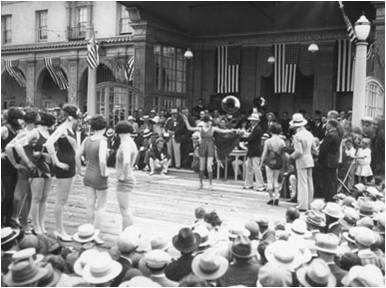 But an incident that occurred in the summer of 1926 overshadowed all of her other accomplishments and kept Los Angeles in the national headlines for months- but not the kind city boosters hoped for. 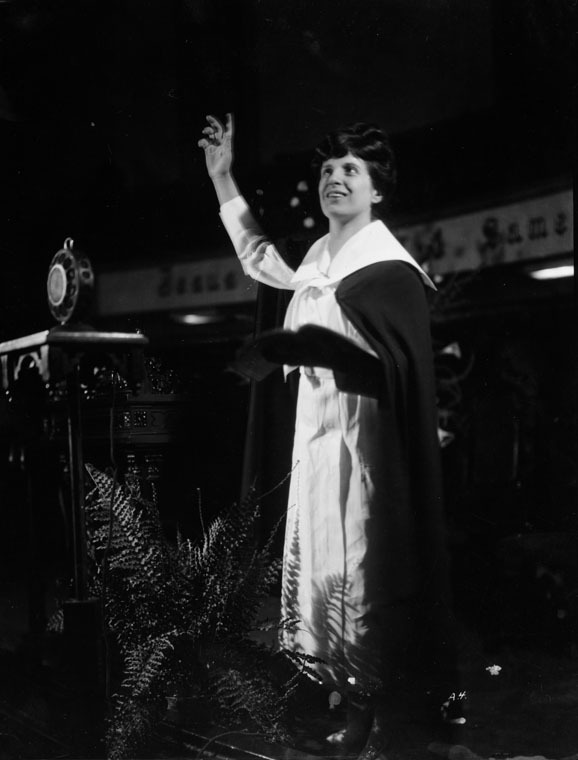 The dynamic pastor with a natural flair for the dramatic was born Aimee Kennedy in Canada in 1890. Raised a Methodist, she converted to Pentecostalism soon after meeting Pentecostal missionary Robert James Semple. They were married in 1908; Aimee was widowed with a baby daughter, Roberta, by 1910. She married Harold S. McPherson in 1912 and had a son, Rolf. 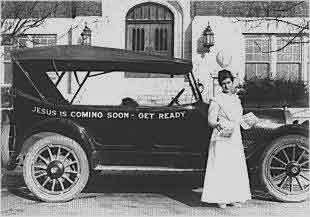 Aimee heard the call to preach around 1915 and answered it by traveling across the country, delivering the gospel from a megaphone in the back seat of a Packard touring car and at tent revival meetings. She’d founded The International Church of the Foursquare Gospel by 1917 and settled in Los Angeles, where, in 1922 she broke ground on her Angelus Temple in the Echo Park neighborhood. 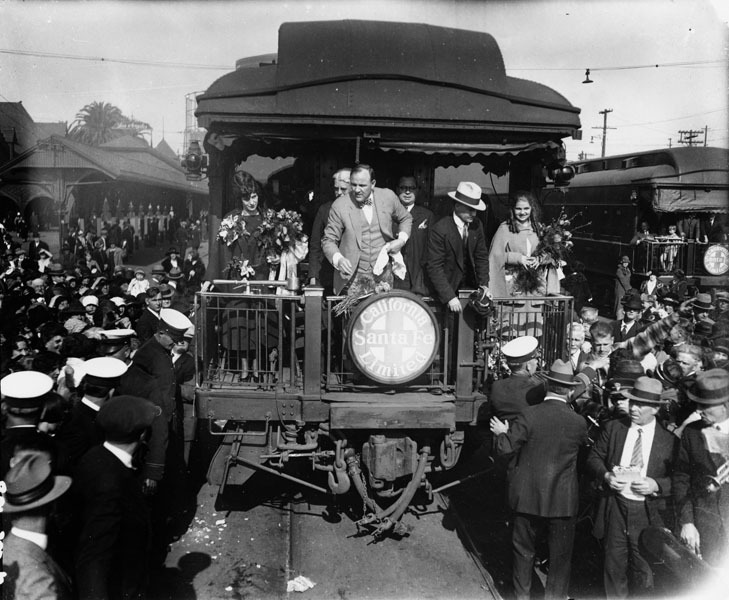 It opened its doors on New Years’ Day, 1923. Aimee gave sermons five days a week and had no problem filling the 5,300 seats. 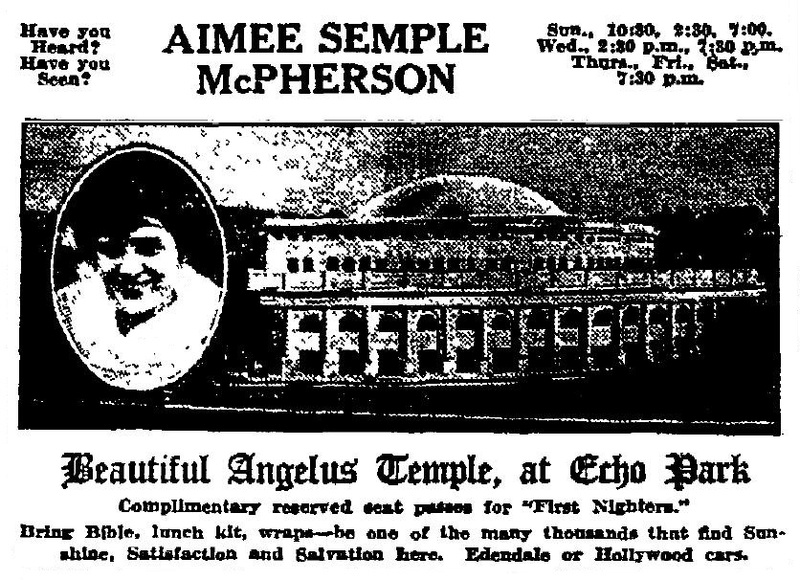 “This is Aimee Semple McPherson, of the Angelus Temple, Los Angeles, California.” Those who couldn’t worship with Aimee in person could tune her in by radio. 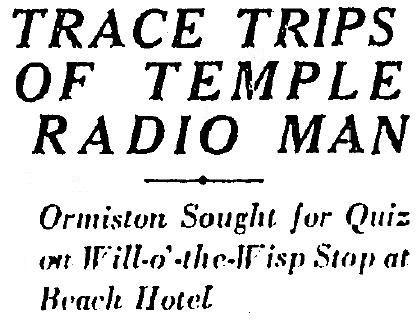 Her own station, KFSG (K Four Square Gospel), went on the air on February 10, 1924. Its last broadcast was in 2003. 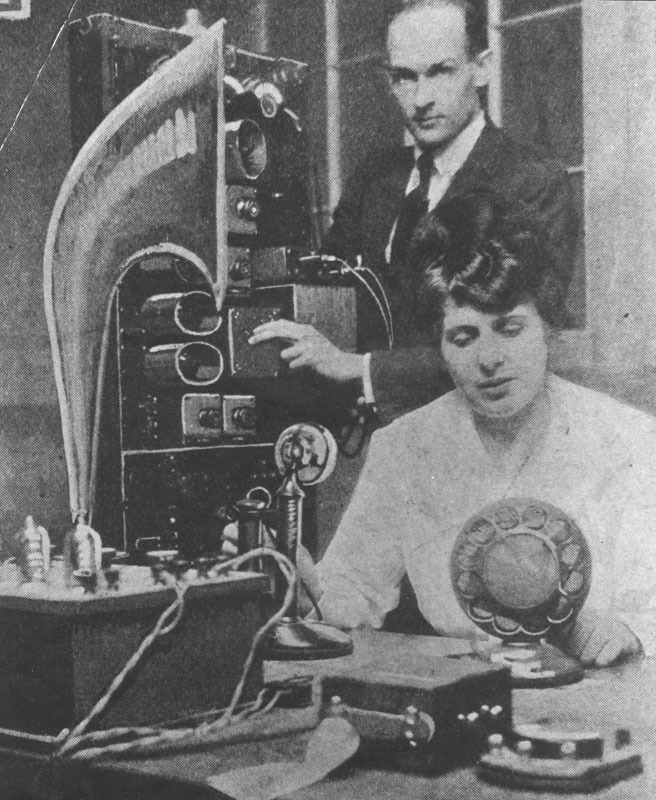 Aimee with KFSG’s radio operator Kenneth Ormiston, testing the equipment. Aimee departing Le Grande Station in January with daughter Roberta (right). Hatless in the center is pugilist-turned-preacher Paul Rader who filled in during Aimee’s absence. 1926 started out fine. Sister Aimee left L.A. in early January for a three month-long tour of Europe and the Holy Land. No, the horribilis really began on May 18. That’s when Aimee, accompanied by her secretary Emma Schaffer, went to the beach between Ocean Park and Venice for a swim and vanished. A distraught Schaffer reported her missing. Police, sheriffs, and life guards combed the shoreline and the sea. As word of Aimee’s disappearance spread, the faithful flocked to the beach to join the search or to pray. Aimee was presumed to have drowned, though rescuers found no trace of her body. Aimee’s loyal followers gathered the beach at Ocean Park the day after her disappearance. A rumor circulated that she would rise from the sea at exactly 3:30 pm. LAPL collection. 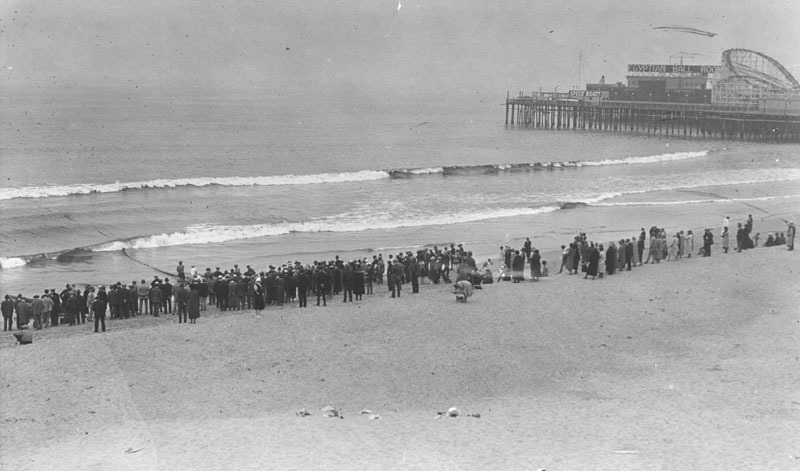 While the search for Aimee’s body continued a few hundred feet away, the annual bathing beauty parade at Ocean Park went on as usual. Aimee would have wanted it that way. It’s hard to pinpoint exactly when the investigators began to suspect that this was something more than a simple case of drowning, but it was about the same time someone noticed that Ken Ormiston, Aimee’s married ex-radio operator, had also gone missing at the same time she did. Someone else pointed out that Ken had disappeared before- right around the time of Aimee’s Holy Land trip. On May 27, D.A. Keyes announced that he would seek out Ormiston if Aimee’s body hadn’t been found by the end of the week. The very next day, Ken turned up at D.A. Keyes’ office, having made a hasty trip from San Francisco when he heard on the radio that he was wanted for questioning. After denying any knowledge of his former employer’s whereabouts, he was dismissed and promptly went back into hiding. It was the day after a memorial service for Aimee on May 30 that the first kidnapping story surfaced. A blind lawyer in Long Beach, Russell A. McKinley, claimed two men approached him and said they were holding Aimee; they wanted McKinley to act as intermediary in collecting the $25,000 reward Ma had offered. Ma suspected it was a hoax (an instinct that would ultimately prove correct, though perhaps not in the way Ma imagined). Meanwhile, LAPD Chief of Detectives Herman Cline was checking up on Ken’s movements. It wasn’t made public at the time, but witnesses identified Ken as the man who’d rented a cottage in the seaside community of Carmel and had stayed there for 10 days with a woman stating on May 19, the day after Aimee disappeared. Ma Kennedy held another memorial service for Aimee on June 20 with three seatings to accommodate all comers. What she didn’t reveal, either to the press or, apparently, the police was that she’d received another kidnapping letter. Dated June 18 and signed “The Avengers,” it too demanded $500,000. Ma may have dismissed it as just another hoax. Or she may have thought something in the letter had a familiar ring to it. In any case, she took no action. On June 23, the thing Aimee’s followers had been praying for happened: Aimee resurfaced- not from the sea, but in Douglas Arizona just north of the Mexican border. She had a fantastic tale and she wanted everyone to hear it. From her hospital bed, her hair freshly curled and dressed in a borrowed pink negligee, she told reporters how she’d been lured from the beach by a couple who chloroformed her and whisked her by car to a remote shack in Mexico. There they held her captive until one day she was able to escape. She’d wandered across the desert until she came upon a house. The Mexican resident helped her get across the border to Douglas where she sought medical care and in due time was reunited with Minnie and her children. 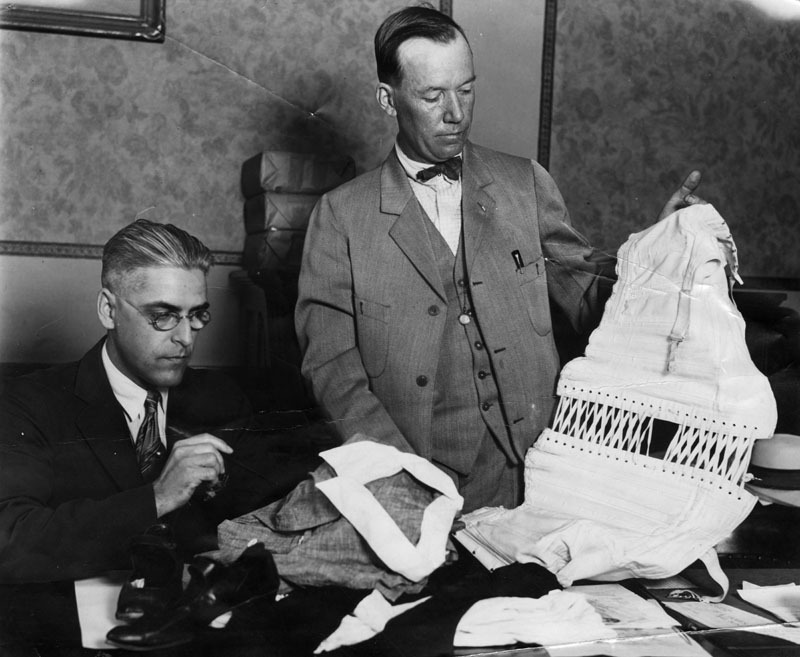 C. N. Wright, secretary to Herman Cline, and Deputy Lieutenant W. C. Allen of the LAPD Missing Persons Detail examining the corset, dress and shoes Aimee had on when she arrived at Douglas. Their condition was more consistent with someone taking afternoon tea than a miles long hike across the desert in 100+ degree heat. 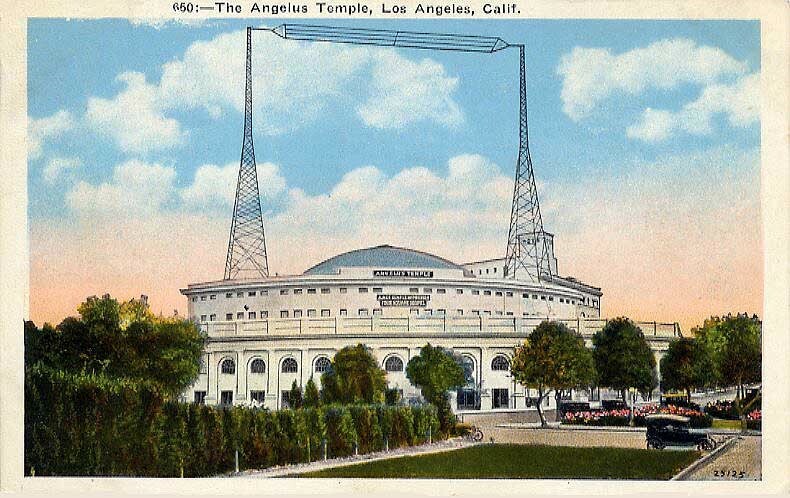 Aimee quickly recovered from her ordeal and returned to Los Angeles where she was greeted by the Angelus Temple band and throngs of relieved followers. The next day, June 27, Angelus Temple was swelled to the rafters with fans keen to hear Aimee tell her story in her own words. Though LAPD detectives had significant doubts about the truthfulness of Aimee’s story, D.A. Keyes announced on June 28 that he was dropping any search for Aimee’s kidnappers. The Grand Jury wouldn’t let it go so easily, however, and under pressure, Keyes reversed his position. On July 6, Aimee and other witnesses were subpoenaed. But after two weeks of testimony the jury was unable to reach a conclusion. “Miss X” came forward. Or rather, Miss X’s sister did- her twin sister. She was Lorraine Wiseman-Sielaff and she claimed she’d been in Carmel to be near her sister who was a friend of Ken’s. She bore a striking resemblance to Aimee. It was a dishonest mistake. 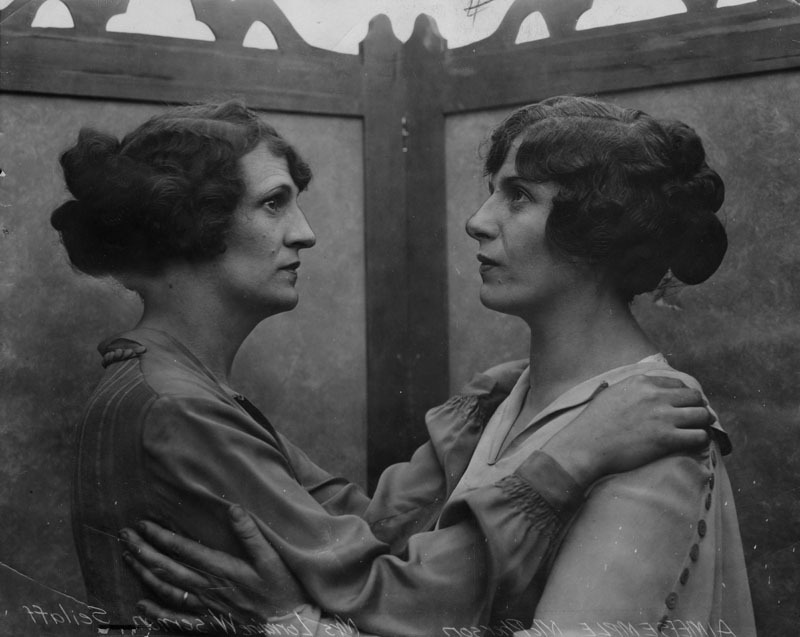 Sister Aimee Semple McPherson (right) and “sister of Miss X” Lorraine Wiseman-Sielaff (left). LAPL collection. Newspapers easily debunked Wiseman-Sielaff’s story within days. She readily admitted it was fabrication, that she had been recruited to pose as (sister of) “Miss X,” and that Aimee herself had coached her, helping her to approximate the evangelist’s hairdo and clothing. 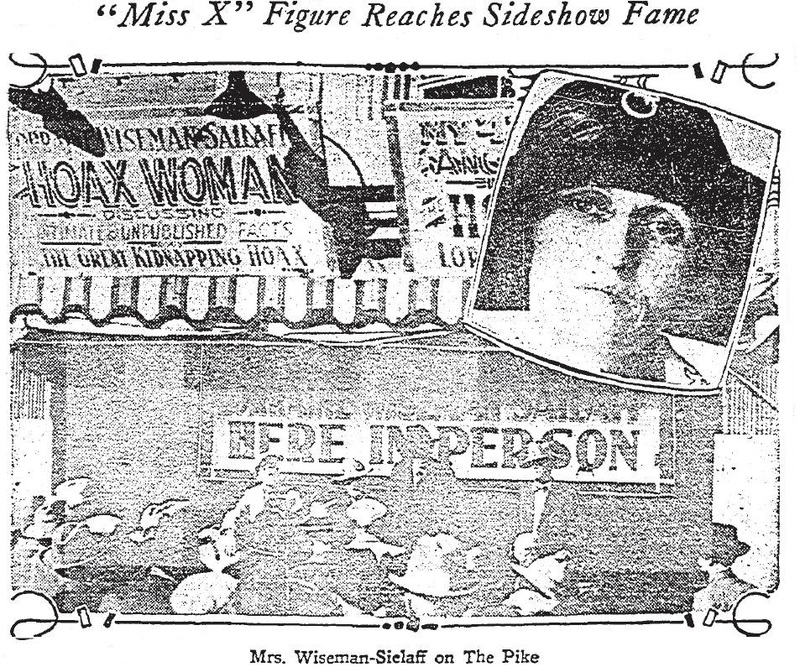 The Burbank Theater on Main Street, which seldom missed the chance to exploit a juicy headline, incorporated the Miss X story into its latest burlesques shows. On September 16, Keyes charged Aimee, Minnie, Ken and Wiseman-Sielaff with obstruction of justice and conspiracy to commit fraud. As the case dragged on through the fall, with a flood of witness coming forth to testify about seeing Ken and the redheaded pastor together at various seaside and L.A. city hotels, Aimee nightly used KFSG to rail against Keyes, who was now involved in legal troubles of his own. Aimee’s preliminary hearing. LAPL collection. The investigation shifted once again to the still-missing Ken, though, once they found him, the D.A. didn’t seem to want him. Private detectives traced him to Chicago but police in the Windy City waited in vain for orders from authorities in the Angel City. Keyes, who was in Washington D.C. at the time to give testimony in a bribery case involving prominent Los Angeles oil millionaire E.L. Doheny, Sr., told reporters he intended to “do everything in his power” to extradite Ken back to California. But as the days ticked by and still no action was taken, Chicago Chief of Police Morgan A. Collins lashed out, telling the press: “Do you mean to tell me that if the District Attorney of Los Angeles wanted this man badly, he could have failed to come here when he was only a few hours away?” Ken eventually turned up at the D.A.’s office in Los Angeles. The debacle finally came to an end on January 10, 1927 when Keyes inexplicably asked the court to drop all charges against Aimee and the other defendants. Aimee soon departed Los Angeles temporarily on a cross-country “vindication tour.” Though she continued to preach to packed houses in Echo Park, her days as a cultural phenomenon had passed. She died Oakland, CA on Sept. 27, 1944. Her son Rolf took over leadership of the church she’d founded. As for Keyes, rumors began circulating almost immediately that he’d accepted a $30,000 bribe to drop the case. An investigation was launched, but what results it produced, if any, were not publicized or acted on- perhaps because by then, Keyes was no longer D.A., having been tried and found guilty on bribery charges in connection with another case- the Julian Oil Scandal.